Valentine’s Day would not be the day of love without celebrating with some form of chocolate. For the ultimate chocolate Valentine’s Day dessert I highly recommend molten lave cakes. They may seem a little intimidating but are well worth the adventure. It is true Moten Lava Cakes are my favorite Valentine’s Day dessert; they are not always practical to make. 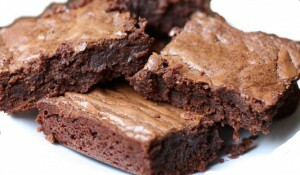 Brownies although simple can transform easily into an elegant ending to any couture Valentine’s Day fare. Top with sliced strawberries, ice cream or cinnamon whipped cream. Slice one in half, add a teaspoon of cherry pie filling then replace the top. Serve with ice cream or whipped topping and a drizzle of chocolate syrup. Use cookie cutters to make heart or circle shaped brownies. Replace this brownie batter in any recipe calling for boxed brownie mix. Brownies are great for bake sales, thank you’s, afternoon snacks and satisfy chocolate cravings like non other. This recipe is full of fudge chocolate flavor. I love using Raley’s brand semi-sweet chocolate chips. They have an intense dark chocolate flavor. Preheat oven to 350 degrees. Line a buttered 8-inch square baking pan with foil or parchment paper, allowing 2 inches to hang over sides. Butter lining (excluding overhang); set pan aside. Put butter, chocolate, and cocoa in a heatproof medium bowl set over a pan of simmering water; stir until butter and chocolate are melted. Let cool slightly. Whisk together flour, baking powder, pepper and salt in a separate bowl; set aside. Put sugar, eggs, and vanilla in the bowl of an electric mixer fitted with the whisk attachment, and beat on medium speed until pale, about 4 minutes. Add chocolate mixture; beat until combined. Add flour mixture; beat, scraping down sides of bowl, until well incorporated. Pour batter into prepared pan; smooth top with a rubber spatula. Bake until a cake tester inserted into brownies (avoid center and edges) comes out with a few crumbs but is not wet, about 35 minutes. Let cool slightly in pan, about 15 minutes. Lift out brownies; let cool completely on a wire rack before cutting into squares.